How to convert the ppt to the jpg file which resolution is 3840x2160? 我要問人他寫法是這樣 https://dotblogs.com.tw/eganblog/2018/05/06/doc_ppt_convert_to_img 只是我不懂裡面為什麼會有 /// <summary> /// Microsoft.Office.Interop.PowerPoint 將PPT轉圖片 /// </summary> /// <param name="pttPath">PPT檔案位置(FullPath)</param> /// <param name="outPutPath">PPT圖檔輸出位置</param> 這是web裡的前端?還是不太懂..... 他public 前面加那幾行是? 我比較好奇的是你那個Word的 ``` object bits = page.EnhMetaFileBits; ``` 我執行到這行就失敗了，不知道你怎麼成功的? 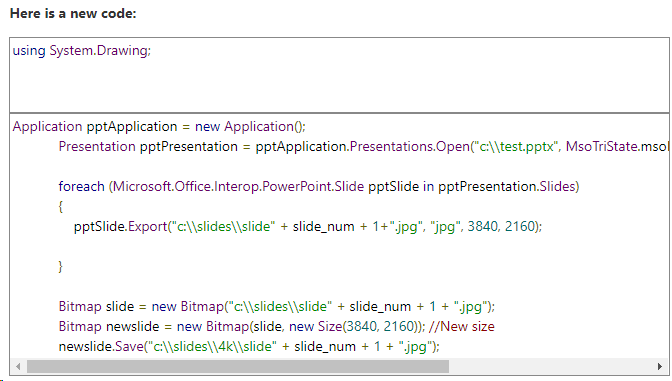 >Microsoft.Office.Interop.PowerPoint 要加入參考，組件的擴充功能那邊 >可以run 但感覺好像沒效果 你有去呼叫那個函式嗎? 有沒有拋出錯誤還是有成功執行了?